Research shows that Planned Parenthood health centers are better able to deliver high-quality, timely contraceptive care to more women than other types of publicly funded family planning providers. Policies excluding Planned Parenthood from the family planning safety net disregard the facts and would have negative consequences for women nationwide. Editor’s note: This article was updated on May 17, 2017 to incorporate newly released data from references 3 and 4. Over the past two years, antiabortion members of Congress and state policymakers have fervently pursued a political and policy agenda to deny public funding to Planned Parenthood. This concerted effort seeks to exclude Planned Parenthood health centers from state and federal funding streams, including the Title X national family planning program and Medicaid, and carries the potential to deprive women of the contraceptive services and counseling, STI testing and treatment, and breast and cervical cancer screenings that Planned Parenthood provides. Although the Obama administration and federal courts had largely stopped these defunding attempts, the Trump administration and the 115th Congress are giving defunding attempts new traction. Notably, the secretary of the Department of Health and Human Services, Tom Price, is a vocal opponent of abortion and Planned Parenthood (see “Recent Funding Restrictions on the U.S. Family Planning Safety Net May Foreshadow What Is to Come,” 2016). Attacks on Planned Parenthood seek to undermine a network that has capably served millions of women for decades. Although proponents of defunding Planned Parenthood argue that other providers—namely health departments and federally qualified health centers (FQHCs)—would easily be able to fill the overwhelming hole torn in the safety net, evidence suggests otherwise.1 Planned Parenthood health centers consistently perform better than other types of publicly funded family planning providers on key indicators of accessibility and quality of contraceptive care.2 Plus, Planned Parenthood serves a greater share of women who obtain contraceptive care from safety-net health centers.3 And in some communities and for many women, Planned Parenthood is the predominant source of publicly funded contraceptive care.4 It is simply unrealistic to expect other providers to readily step up and restore the gravely diminished capacity of the family planning safety net were Planned Parenthood defunded. Women can often obtain care more quickly from Planned Parenthood. Sixty-two percent of Planned Parenthood health centers offer same-day appointments, a proportion similar to FQHCs (58%), but higher than health departments (42%).2 Moreover, the average wait for an initial contraceptive appointment at a Planned Parenthood health center is 1.2 days, while the average wait time for such a visit is 2.5 days at sites operated by FQHCs and 4.1 days for health department sites. Third, Planned Parenthood sites are particularly likely to help women who choose oral contraceptives to get their pill supply without having to make an additional trip to a pharmacy. 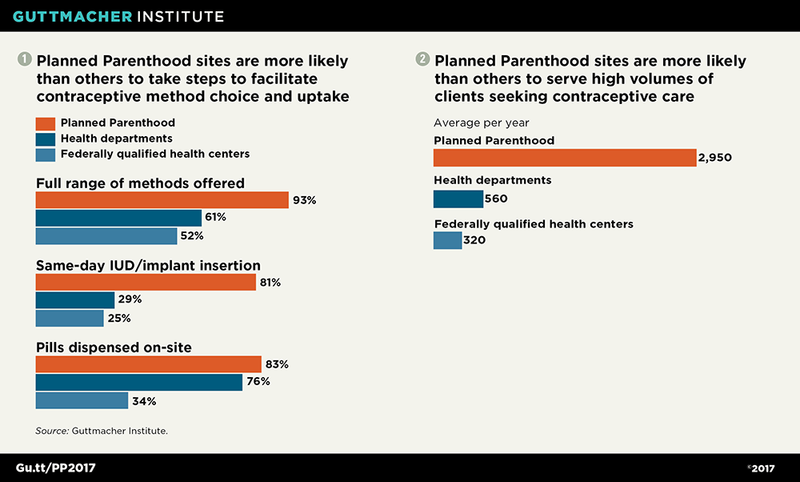 The vast majority of Planned Parenthood health centers offer initial oral contraceptives and refills on-site, as do three-quarters of health department sites; only one-third of sites operated by FQHCs do so.2 In addition, 99% of Planned Parenthood health centers allow women to delay a pelvic exam when initiating hormonal contraceptives and use the “quick-start” protocol to enable a client to start the pill on the day of her visit, regardless of where she is in her menstrual cycle. Planned Parenthood is an important source of care for many women. 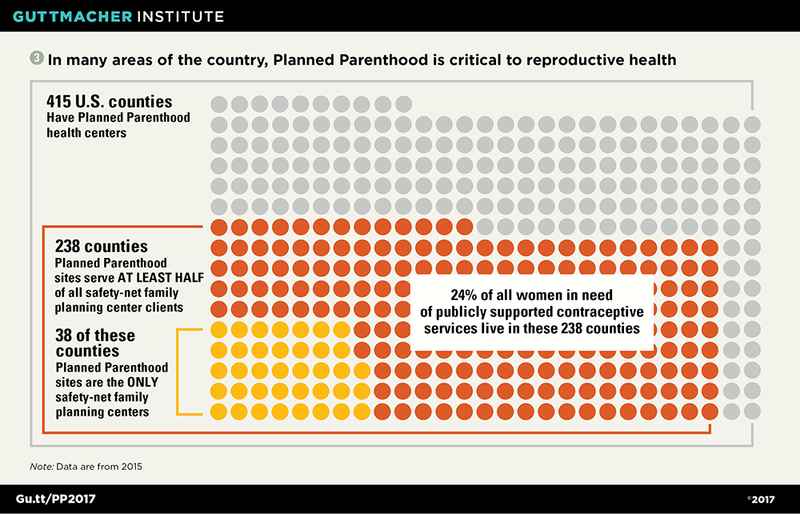 In 238 of the 415 counties with a Planned Parenthood health center in 2015, Planned Parenthood served at least half of the women obtaining publicly supported contraceptive services from a safety-net health center (see chart 3).4 One-quarter of all women in need of publicly funded contraceptive services lived in these 238 counties. Unfortunately, it seems likely that antiabortion policymakers will disregard this very real need in their communities and continue their myopic campaign to defund Planned Parenthood in the coming year. Although it is difficult to predict exactly how potential restrictions on Planned Parenthood’s eligibility for various public programs might play out, it is highly doubtful that other providers could step up in a timely way to serve the millions of women suddenly left without their preferred, and sometimes only, source of care. It is also unclear whether other types of safety-net health centers would be able to consistently provide the same degree of accessible, high-quality contraceptive care offered by Planned Parenthood. What we do know is that women nationwide rely on Planned Parenthood health centers for the contraceptive and related services they need. For many who are low-income or young, who are immigrants or who find themselves uninsured, losing Planned Parenthood would mean losing a trusted provider, and in some cases, the only source of care they have. 1. Rosenbaum S, Planned Parenthood, community health centers, and women’s health: getting the facts right, Health Affairs Blog, Sept. 2, 2015, http://healthaffairs.org/blog/2015/09/02/planned-parenthood-community-health-centers-and-womens-health-getting-the-facts-right/. 2. Zolna MR and Frost JJ, Publicly Funded Family Planning Clinics in 2015: Patterns and Trends in Service Delivery Practices and Protocols, New York: Guttmacher Institute, 2016, https://www.guttmacher.org/report/publicly-funded-family-planning-clinic-survey-2015. 3. Frost JJ, et al., Publicly Funded Contraceptive Services at U.S. Clinics, 2015, New York: Guttmacher Institute, 2017, https://www.guttmacher.org/report/publicly-funded-contraceptive-services-us-clinics-2015. 4. Frost JJ and Zolna MR, Response to inquiry concerning the availability of publicly funded contraceptive care to U.S. women, memo to U.S. Senator Patty Murray, Senate Health, Education, Labor and Pensions Committee, New York: Guttmacher Institute, May 3, 2017, https://www.guttmacher.org/article/2017/05/guttmacher-murray-memo-2017. 5. Zolna MR, Kavanaugh ML and Burke K, Guttmacher Institute, special tabulations of data from the 2016 Guttmacher Institute Survey of Contraceptive Patients.